How to de-couple DMX512 with opto-isolators? I'd like to build a DMX512 device. The problem I have is how to decouple the device from the bus. I decided to use opto-isolators, but how should I wire the diode part of the isolator? Since I need TTL/RS232 levels on the controller side, I'm using either a MAX485 or ADM485 to convert the RS485 levels (DMX512 is just an implementation using RS485) to TTL/UART levels. But where and how should I use the opto-isolator? Before or after the MAX485? I was thinking before, right at the bus, but I'm not quite sure how the circuit should look like. The device is only supposed to receive, not send to the bus. I'm doing that very thing in a project I'm working on right now. I can't take credit for this, but it sure has worked well. Both the MAX485 and MAX481 should work well. I modified this design a bit. This design currently has a 133ohm terminating resistor between pins 2 & 3 of the DMX connector. This is used to terminate the end of the dmx bus. I added a switch so that I could enable or disable the terminator. You'll also note that a DC/DC converter is used to create isolated supply and ground. I'm sure someone else can explain, in better detail, why this is important. My understanding is that it helps with ground loops and voltage differences with the external devices that are connected to the dmx bus. The opto-isolators are after the MAX485. Between MAX485 and the μC. 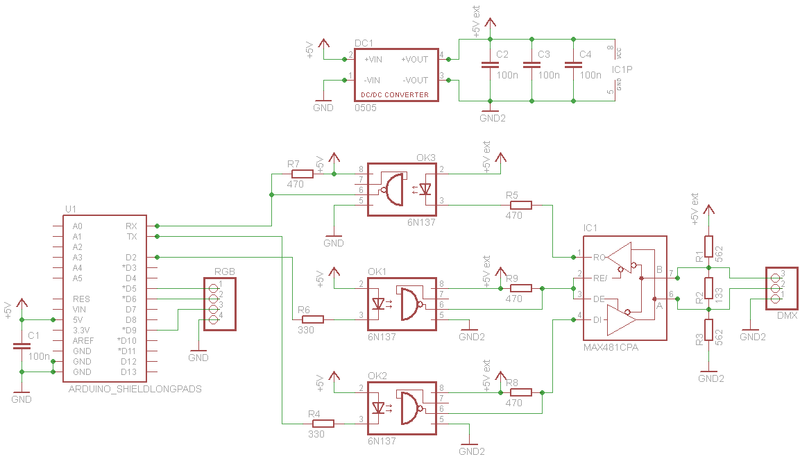 The diagram is from the app note Using Isolated RS-485 in DMX512 Lighting Applications. The architecture with opto is described. At the same time, Analog Devices is trying to push their ADM2487E magnetic coupler. Not the answer you're looking for? Browse other questions tagged opto-isolator rs485 dmx512 or ask your own question. 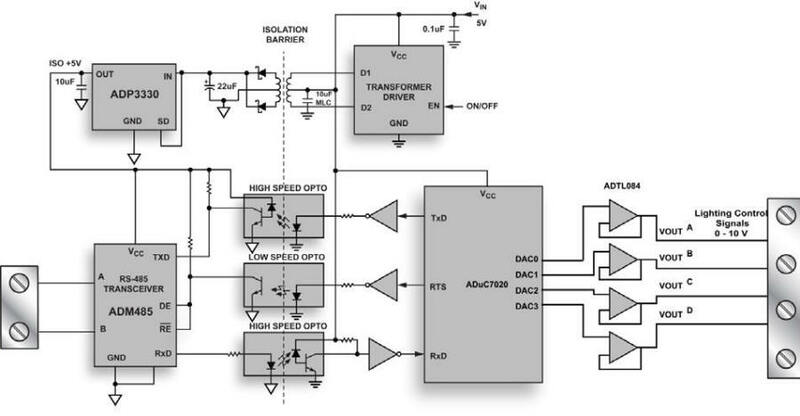 How to simulate bidirectional opto-isolators in Proteus?